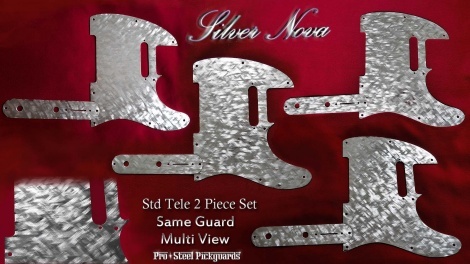 'SILVER NOVA' MATCHING SET GUARD AND CONTROL PLATE FOR FENDER STANDARD TELECASTER. Silver Nova also available for more Tele Pickguards. See further below for list. Silky smooth to the touch, with rolled & polished edges. Light refracts from different directions like 3D, following the viewing angle and direction of the polished surface, with only 20% of the reflective mirror background surface remaining. No color is added, it is still slightly reflective of surroundings and light. The photo above was taken indoors with natural ambient daylight. The Silver Nova pattern is carved smoothly into the mirror surface, using alternative triple direction, with 200% more surface effected than 'Mirror Spark'. This method injects an ultra dynamic quality to the supreme interactive surface of light reflects that stainless steel is best at. Sparks a gleam from any angle. See Close Up surface view of Silver Nova guard. Polished smooth & gleaming, 100% non-magnetic stainless steel, corrosion free. Squier Tele's: Will fit recent Squier Telecasters. If a standard Fender Std Telecaster guard fits, then this guard will fit. Tele S. P90 (Bridge Std Tele single coil, P90 neck).